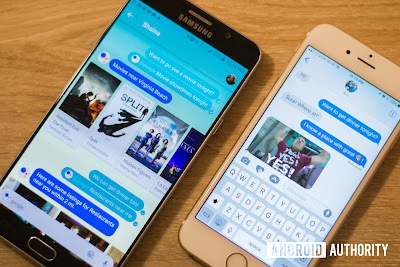 However, the default messaging app on Android smartphones - Messages - is still a comparatively basic SMS client. On Thursday, the company said it was "pausing" development of its latest effort - Allo - which was launched in 2016. Google's rivals such as Facebook Messenger and WhatsApp support advanced features such as typing indicators and high-resolution pictures. Apple's iPhones have the similarly feature-rich iMessage service built-in. The standard is known as the Universal Profile for Rich Communication Services (RCS) - but it will be given the more consumer-friendly name of Chat when it is rolled out to Android devices. As with Apple's iMessage system, if the intended recipient does not have a Chat-compatible device, messages will be sent via the old SMS system instead. Since messages are sent over the internet, they will not use up a customer's SMS text message allowance. However, a mobile operator could in theory charge customers a separate fee to use Chat. Samsung, which already replaces Android's default messaging app on its devices, will integrate RCS with its own software. Google's Anil Sabharwal told technology news site The Verge that "RCS continues to be a carrier-owned service", which means that messages can still be legally intercepted.